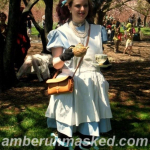 This is my original Alice in Wonderland dress which my mother made for me when I was in college. I punked it up a little bit with tons of my grandmother’s jewelry, a great little leather purse which was a gift from a customer, and my reliable old Timberland boots. 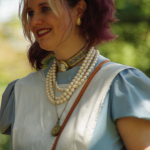 This photoshoot was organized by the steampunkfashions community on Live Journal and was shot at the Brooklyn Botanical Gardens in 2009.